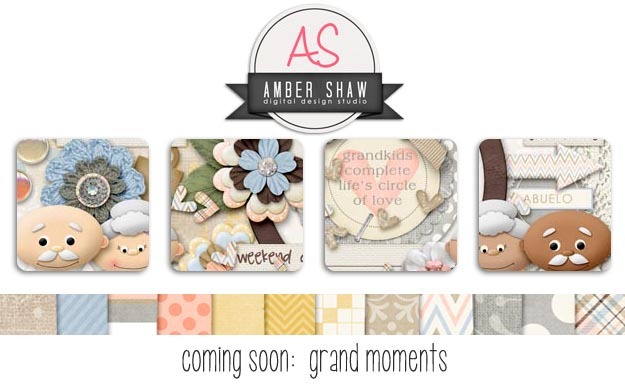 designsbyambershaw: Comment for a GRAND chance to win!! Here is a sneak for a wonderfully grand kit full of unique hand drawn goodness that is releasing this Friday. Want it before it releases? Then comment here and click on the "I commented" box on the Rafflecopter widget to be entered for a chance to win. Comments will be considered through 6-27-13 12:00 pm and the winner will be chosen shortly thereafter and contacted via email. Enjoy the rest of your weekend!! Oh I have some wonderful pictures to scrap with this new kit, would love to win. Thanks for the chance! awww that is so sweet! I just took a bunch of photos that would work perfect with this kit. :) thanks for a chance to win! Looks very cute - thanks for the chance to win it! I have 7 grandchildren so I have lots of uses for a kit like this. It looks like a fun one. I am always scrapping my grandkids. This kit looks great! Thanks for the chance. Wow, this looks so sweet. Thanks for the chance to win. My son has seen his grandparents on his dad's side only once, when he turned one, and he's now two. Both grandparents are overseas, so it's really hard, but we take heaps of pictures when they do see each other. I'm glad we have Skype. I even have pictures of my son hugging the computer when we are online with them. Gosh how absolutely adorable are the grandma and grandpa in the peek. Excited to see the rest of this! What a beautiful kit, thanks for the chance! This looks so beautiful! Thanks for the chance!!! Looks nice! Thanks for the chance to win. It's a beautiful kit as always! Just in time for a visit to my grandparents!! Thanks for the opportunity!